People heading to Santa Cruz continue to try to cut through Los Gatos city streets despite efforts to stop the behavior. Marianne Favro reports. Despite efforts to quell the behavior, Los Gatos residents continue to battle eager beachgoers wishing to cut through the South Bay city en route to Santa Cruz. 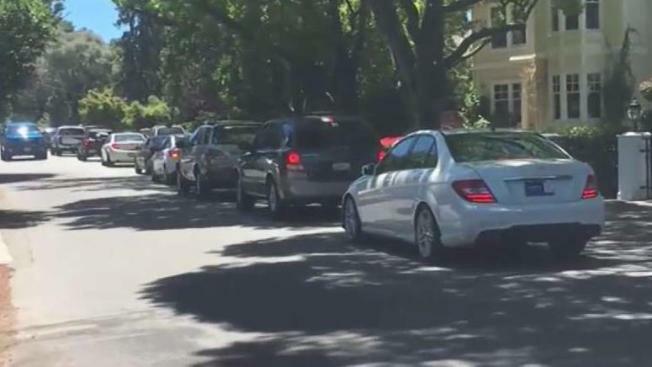 Amid the Bay Area's first heat wave of the summer season, drivers on Saturday tried to bypass a bottlenecked Highway 17 by meandering through Los Gatos city streets. Their efforts were thwarted by the city's choice to close the convenient shortcut via the Santa Cruz Avenue on-ramp to southbound Highway 17. The on-ramp closure, which will continue every summer weekend moving forward, clogged typically quiet neighborhoods with impatient drivers. "All these five streets here were completely bumper-to-bumper stopped," resident Debbie Moessinger, who struggled to back out of her own driveway, said. "Drivers were frustrated, weaving in and out of traffic, going the opposite direction, speeding around corners. There were emergency vehicles that couldn't get through." Moessinger blames traffic apps that offer alternate routes via neighborhoods for causing the continued problem. She has since created a petition demanding the makers of the those traffic apps to only re-route drivers using major streets instead of residential neighbors. Moessinger says more than 800 people have signed the petition. The traffic issue continues occur despite city officials placing warning signs about the on-ramp closure along nearby freeways and streets.